Great Passion Play (Eureka Springs, Arkansas, USA). Photo courtesy of the Great Passion Play. Annual 2-week performance run, hosted by Mesa's LDS Temple. Sixty-five minute production portrays the life of Jesus with 400+ member cast. Set on 15 acres, 11 miles from Walt Disney World, the Holy Land Experience describes itself as a "living biblical museum," with numerous exhibits and theatre productions. In addition to daily Passion Play performances, there is a floor model of Jerusalem c. 66 AD, "the largest indoor replica in the world"; Herod's Temple on Mount Moriah; and, the Garden Tomb. The park also hosts "The Scriptorium: Center for Biblical Antiquities." Live action theater presentations of biblical stories. Past and ongoing shows include: Noah's ark, Jonah and the whale, and the life of Moses. Live action theatre presentations of biblical stories. Past and ongoing shows include: Noah's ark, Jonah and the whale, and the life of Moses. Passion Play operates on a 10-week season (beginning in June, ending in October). Experience "a powerful dramatization of music, pageantry, and Hebrew dance." Three 120-member cast performances every December. Dinner theater with live nightly performances of song and biblical events. Live biblical theatre and musical performances. Outdoor Passion Play site is set in a walled replica of Jerusalem. 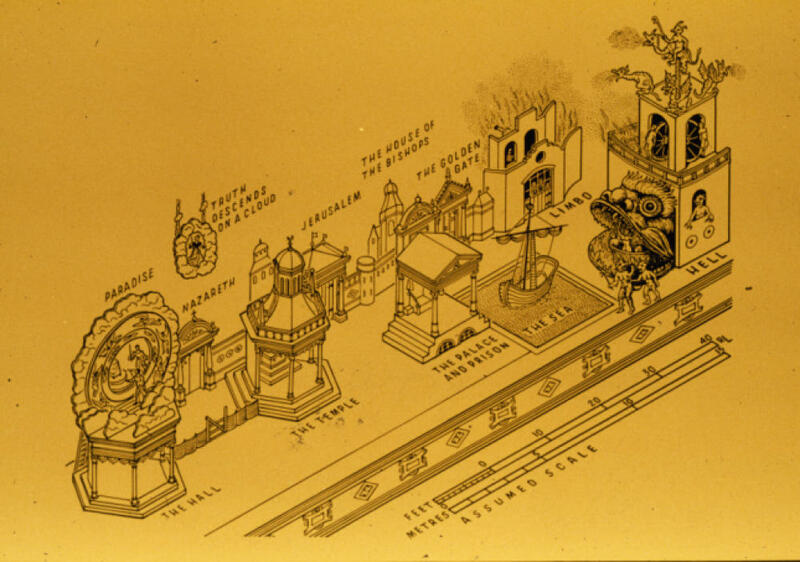 Nine stages depict 26 scenes, from the Sermon on the Mount to the Resurrection and Ascension of Jesus. Set in an outdoor "natural amphitheater," stages Passion Play performances. In 2001, the site added a "Jerusalem Wall" replica. Held every five years in a 4,000-square meter theatre, this Passion Play uses 400 actors. Living nativity scene enacted seasonally.